Let me be the first to admit it; I never thought I’d make kombucha. It was the SCOBY, mostly, that kept me away. The SCOBY, a whimsical acronym for Symbiotic Culture of Bacteria and Yeast, is an ominous looking beast. It’s whitish, with a rubbery, gelatinous texture, and it grows of its own accord every time a new batch of tea and sugar is introduced into its environment. I thought the SCOBY was a mushroom (or some sort of brain) but turns out I was wrong. SCOBY is made of acidophilic yeast, acetic acid bacteria, and microbial cellulose. For the record, the SCOBY’s home jar should be covered with a breathable towel. I just took mine off so you could see the SCOBY in all it’s…uh…glory. Sounds delicious, right? I mean, where do I sign. Tea mixed with bacteria and yeast. YUM. But hang on. How do you feel about yogurt? Because yogurt is made by mixing dairy or nut milk with bacteria to produce lactic acid. How about beer? That’s the product of barley, water, hops, and yeast. And cheese? That’s milk mixed with a variety of bacteria which aids in creating texture and flavor. The ingredients sound sketchy until you consider the science. Microbes are amazing creatures. They transform everyday ingredients into new and different flavor sensations, aid in food preservation, and give us a healthy way to maintain our body’s necessary bacterial levels. Kombucha, a centuries-old effervescent tea beverage, is a simple way to enjoy all three of those benefits. My other concern (aside from having a floating brain-like organism in my kitchen) was the potential for contamination. Working with live bacteria means there’s always a chance for things to go wrong. Luckily, it seems maintaining a safe, healthy SCOBY culture isn’t all that difficult. First off, kombucha is full of tea polyphenols and acetic acid, both of which naturally ward off harmful bacteria. Second, using properly washed hands and equipment aids in keeping the tea clean. Third, using the right containers (always glass, never ceramic) keeps away potential problems with leeching lead. Decreasing sugar intake. In trying to be mindful of my sugar habit, I don’t buy juice, soda, flavored coffee, or any other beverage that has a huge amount of hidden sugar lurking behind the label. (That doesn’t mean I don’t eat cookies. It’s just a fine balance.) Kombucha, with its minimal amount of sugar, is a bottled beverage that still feels like a treat. Using garden produce. The kombucha I like most is a two-step process: the initial ferment (using tea, sugar, and the SCOBY), and the secondary ferment, which is the process of adding flavor, sweetness, and effervescence to the tea. This summer, most of our flavor mixes have come straight from the farm: apples, plums, kale, carrots, tomatoes, and mint. The juice is mixed directly with the tea, sealed in an airtight glass jar, and left to fizz. Juicing for kombucha is a useful way to incorporate garden vitamins into daily life. Immune system benefits. With four children and a husband in and out of school, pre-school, the gym, the library, church, and the great outdoors, we encounter a lot of germs. According to the Mayo Clinic, “kombucha tea may offer benefits similar to probiotic supplements, including promoting a healthy immune system and preventing constipation.” While there are plenty of other proposed health benefits/risks to kombucha, the beneficial probiotics are the one thing that most doctors agree on. Getting the family involved. My kids have taken an interest in helping juice, bottle, and mix kombucha. This naturally led to them wanting to try it. So far, the two biggest flavor hits have been apple and mango, although carrots were, according to my girls, the most entertaining items to juice. My friend who gave me half of her SCOBY to get started noticed the same trend – her boys now love helping with the process. Kombucha is a new way to get the family playing together in the kitchen. Growing taste buds. The more I cook, the more I understand about the four elements of good cooking: salt, fat, acid, and heat. For a short but totally engrossing podcast on the topic, click here. Salt, fat, and heat I understood, but acid… let’s just say it took me a while to start noticing when the acid was present vs. absent, and how that impacted the flavor. Kombucha, with its tart, vinegary notes, has an unmatched flavor profile that I’ve learned to appreciate. Additionally, I’ve found that drinking kombucha helps curb my appetite and clear my palate when I’m craving something sweet. From skeptic to student, understanding the basic science around kombucha has been a fascinating journey. I’ll post more once I have a solid repertoire of flavor combinations and ratios. Until then, pick up a bottle at the store sometime, or come hang out and let me pour you a glass. Leave me a comment below – let’s hear what you think! Amateur Farm Hour: Meet the Meat Birds! Hey! Great day for a sale! Say, I’d like to buy your dog kennel. No, I don’t have a dog. It’s for my meat chickens. Yes, I said MEAT chickens. I’m going to use it to transport them to the butcher. No, they aren’t ever going to lay eggs. No, I’m not going to butcher them myself. I’m 33 weeks pregnant. Yes, we’re going to eat them. We’ve kept backyard egg layers for the last three years, and it’s been great. According to Hobby Farms, the eggs we get from our little flock contain less cholesterol, less saturated fat, increased vitamins A, E and D, more omega-3 fatty acids, and more beta carotene. As a bonus, we can also thank our ladies for entertaining our girls, keeping down the deer and wood tick population, and for, ahem *fertilizing* our yard. A few months back, sprawling in our chairs in front of the fire, Jason suggested we infuse the flock. Our egg laying chickens were coming into their later years of production, and wouldn’t it be nice to have the new birds already laying before the old birds quit? Oh, and by the way, what did I think about meat birds? He went on to extol the virtues of home-grown birds: hormone-free, yard ranged, fed a good diet, killed humanely by a local butcher, and delivered direct to my freezer. And of course we’d get 25 of them. It should be worth our while, right? I tentatively agreed those were all true and good things, though I wasn’t sure where I was going to put the meat from that many birds in my already-full freezer. Fast forward to this spring, when I got a call from the post office. Your live animal shipment is here and ready for pick up. I had a peek at them. They’re so cute! And noisy! Small town living at its finest. So we made a quick list, piled into the van, and picked up our new farm babies. As I leaned over the same counter I normally weigh ebay boxes on and bent back the cardboard, I couldn’t stop my own gigantic smile. They were indeed adorable, all yellow fluff and tiny beaks. I couldn’t wait to show the girls. Predictably, Ellis loved them, Gabby said she loved them but immediately threw the one I gave her to hold on the floor, and Lucy regarded the chick I placed in her lap with a mixture of fear and glee and refused to touch it. We made a quick stop at the feed store for another heat lamp, two bulbs, and a sack of feed I thought for sure would last almost a month, given that the chicks weighed less than a golf ball, and were roughly the same size. We were ready. The next twenty-four hours were a circus. It was April in Minnesota, and temps were still dipping below 40 degrees at night. We opted to keep the chicks on the front porch in Rubbermaid storage totes lined with wood chips. Each tote had a doll-sized gravity waterer and a small dish of chick crumbles which resembled grape nuts. We positioned the totes under the heat lamps and prayed the whole setup wouldn’t melt or spontaneously start on fire. There was also the issue of the girls. After they got familiar with the chicks, there was no end to the requests to go in the entryway and see the babies. Rules, admonitions, and threats about not dropping, squeezing, or throwing them in the air were mostly ineffective. Oh. There was also the time I almost killed every single one of them by putting them in the bathtub and cleaning off their bellies, which had gotten dirty from being in such tight quarters in the totes. Unfortunately, this also brought the chicks’ body temperature dangerously low and resulted in me on the bathroom floor with a towel, a blow dryer, and a lap full of pitifully noisy wet chicks that looked more alien than animal, but we don’t need to talk about that. Three weeks later, the meat chicks are more like awkward middle schoolers. They are growing so quickly that their feathers can’t keep up, which results in some weirdly patchy looking birds. They’ve also now gone through TWO fifty pound bags of feed. Apparently they are almost half grown at this point, which means my $10 dog kennel is going to come in handy in about a month. Very soon, we’ll be letting them out into the fenced in chicken yard to scratch, peck, and eat weeds to their hearts content. The egg layers will lose their comfy quarters for a month, but Jason’s been hard at work building them a portable coop with egg boxes and nesting racks, so really, I think they’re getting the better end of the deal. And us? Well… we’ll see. I’m keeping track of expenses because we want to make sure this venture is cost effective before we get any more ideas about doing it again, and in the meantime, I’m filling our five gallon chick waterer and gravity food bin every day like a BOSS. Stay tuned. Or better yet, make dinner plans with us in July and ask for chicken to be on the menu. PS! Recently, two very kind teachers at Taylors Falls unexpectedly gifted Jason and I with this sign. Dear Erin and Laura, we love your work and your generous hearts – thank you! If you’re in the market, Wood Pallet Treasures creates some fantastic, customized stuff. Definitely check them out! It started with a mug brownie. You know. One of those fad cooking things that sprouted, bloomed, and faded after a few months in the fickle soil of the interwebs. Take a few things. Chocolate, mostly. Mix them in a coffee mug. Microwave. Bada bing, bada boom. Single serving mug brownie. Somehow, I missed this craze. (Or just I always wanted more than one brownie.) Either way, I’d never tried the mug method before, until last week. The opportunity arose. I had a little extra pumpkin bar batter. 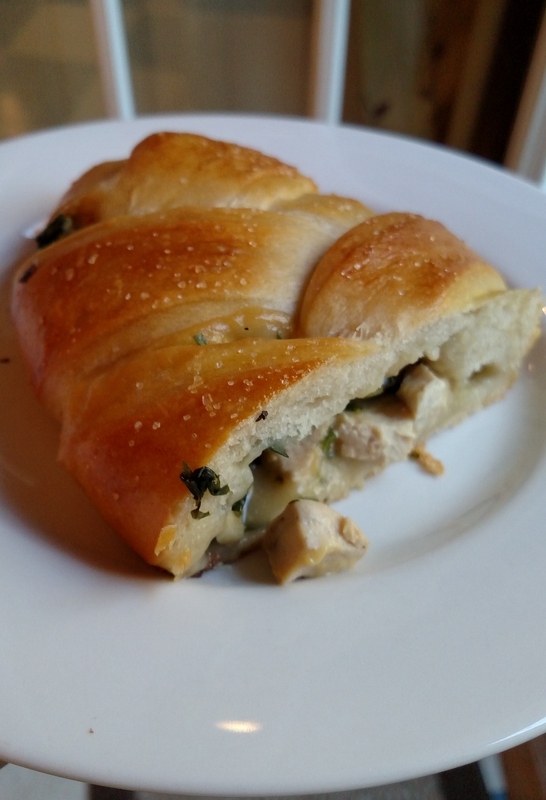 And since it was a new recipe that I was sending out the door with my husband for a community event, I wanted to make sure the product was edible. So I poured the leftover batter in the mug, put it in the microwave, and closed the door. At this juncture, a reasonable person would have googled an actual mug brownie recipe to get an idea of how long you’re supposed to microwave this magic. Apparently, I’m not reasonable. And I also lack a little common sense. Somehow, in the mess and muddle of my day, my pointer finger beeped out FOUR MINUTES, and hit start. I realized this was a little long, but I figured I’d check it after a minute or two and see what was happening. Somehow, one thing led to another and I left sight of the microwave because my two year old announced she had to go potty, and this announcement/action chain goes much better when supervised. Which means I forgot about the mug. This is how it goes, right? We find ourselves with what seems like a really good idea, and we even manage the wherewithal to start acting on it. Somehow, we get sidetracked. The great blog series we planned/exercise regiment we started/DIY project we bought supplies for/committee we volunteered on gets swallowed by this thing called NEED – which usually belongs to someone else – and all the good things we hoped to accomplish start to smolder and gather coats of ash. We are left with two choices. We can blow on the coals of those ideas and intentions and watch the flames come back to life, or we can do nothing and watch the ash slowly turn grayish white as the heat dissipates. For the last month, I’ve been a little out of breath. Maybe you have too. Maybe the kids are still in the after-shock of daylight savings time. Maybe work is going all crazytown before the end of the year. Maybe the looming HOLIDAY season sends you less into hot cocoa land and more into snarl zone. Whatever it may be that’s taking your breath away, please don’t let go without a fight. You NEED to foster the things that give you life. They are what make you unique, joyful, and fulfilled. Which is why today I’m blowing on my coals, sitting at my desk, watching words fall off my fingertips and onto the screen. I didn’t have an epiphany. I didn’t get a day all to myself to rest and recharge. I simply remembered something. Writing gives me energy. Doing the things I love to do wakes me up, shakes me out, and resettles me a little more happily into my life. Meanwhile, in case you’re wondering, four minutes is WAYYYYY too long to microwave a mug brownie, or a pumpkin bar, or really much of anything. I finished helping my daughter in the bathroom only to return to the kitchen and find noxious clouds of billowing green smoke emanating from my microwave. The timer dinged before I could race over and open the door, but it didn’t matter. The stench. The smoke. I gagged and coughed as I opened the door and waves of burnt cake smog assaulted my eyeballs. What remained in the bottom of the mug resembled charcoal and smelled like acrid darth vader death breath. The next hour would have made a comical video. My daughters and I waved vinegar-spritzed rags like helicopters all around the kitchen. We concocted vinegar and lemon oil “soup” to boil on the stove top and the wood stove. We opened the doors, turned on the fans, turned up the music and shiver-danced to move the air around. The stench didn’t completely leave, but we at least found a way to get our breath back. And so I leave you with this. Moral of the story: Don’t cook a mug brownie/pumpkin bar for four minutes. Other moral of the story: Don’t let what has sidetracked you permanently* keep you there, on the sidelines. Take a deep breath. Find the thing you love that’s been set aside, and fan it back to life. Comment below and tell me about the things you love that always take a back burner (or a four minute death ride in the microwave). *My house feels like it’s permanently going to be clinging to this reek, so if anyone has any good smell-busting ideas, I’m all ears! The wing was attached. (This is Minnesota DNR regulation for transporting game, lest you think my husband was just being mean.) And I was going to have to saw through the bone to get it off. 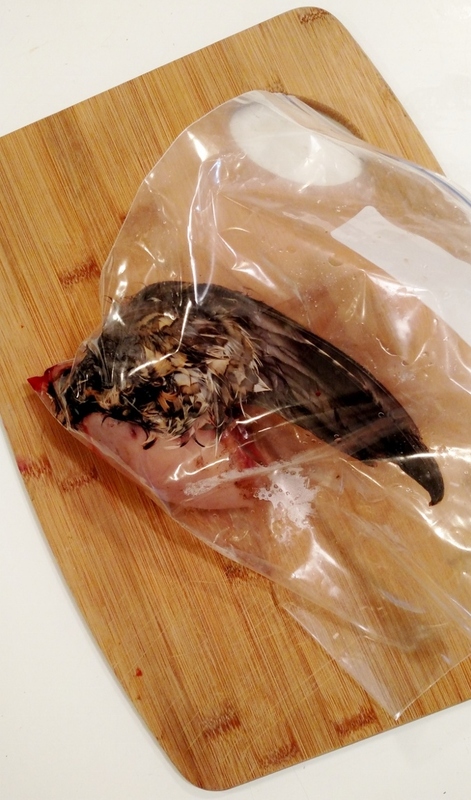 It took me a while before I finally worked up the nerve to move the dead bird in the ziplock bag from the fridge to the cutting board. I stood there, knife in hand, unsure of what to do next. I have the feeling I wouldn’t be alone in this. We like to talk organic and locally sourced. There’s something rustic and gratifying about farmers markets and roadside stands, and the way we feel when we pull out our reusable canvas bags and pass actual cash between hands. But when push comes to shove, we want our vegetables symmetrical, our meat devoid of anything that makes it look like an animal, and our apples buffed to a bright red shine. That’s not reality though, is it? In real life, those pink oval-shaped chicken breasts resided in a living, breathing chicken with feathers and a beak. Vegetables come from soil, sun, and crap (I’m sorry – I mean compost.) Real apples often carry marks of blight and beetles. Somehow, we’ve divorced the ugly side of food. We prefer the Stepford version of polish and wax and mechanical separation. So when I came face to face with a bird wing in my fridge, I wanted to shove it to the back and forget about it. Let four days pass, and then toss it on grounds of raw meat bacteria growth. Organic imperfection is inescapable. And somehow, we’re a little afraid of it. But we don’t have to be, if we can stop seeing marks of difference as imperfect. If we could trust that sometimes, imperfection is something God wants us to see, because it brings us past the thing itself and into the reasons behind it. After all. Perfection is beautiful, but rarely does it teach us anything. Meanwhile, I still had a dead bird on my cutting board, and the girls were getting curious about it. Feathers, mama? Birdie? Yes sweetie. Feathers on a birdie. Birdie for supper. In reality, the dirty work took no more effort than slicing off the wing with a knife, which felt like cutting a toothpick. Suddenly, the grouse looked like a very small chicken. I took the rest of the meat off the rib cage, and put it in a gently simmering pan of chicken broth and garlic. It took all of five minutes to cook, low and slow. However, there wasn’t a lot of it. So I cut up some broccoli, chives, garlic, and parsley, and added that to the pan. I also added half a can of *wait for it* cream of chicken soup. We’re all about classy here. (Hey, after I posted a picture of my intended supper plans, a friend reminded me grouse can be dry.) I had bread dough in the fridge, so I rolled it out and cut the edges. 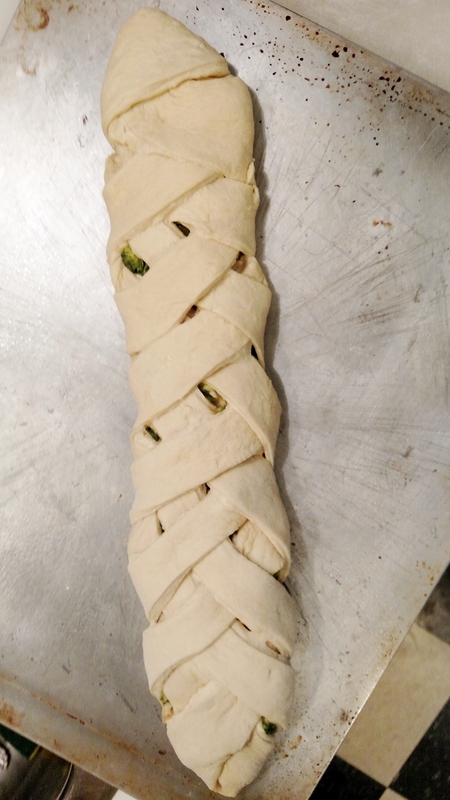 Then I gently poured the meat mixture into the center of the dough, and overlapped the bread edges so that it looked like a braid. Bada bing, bada boom. I cooked wild game. Thirty minutes later, my tastebuds confirmed what my nose had been smelling. It was GOOD. It was REALLY good. The girls ate every last bite without complaint, and my husband got the satisfaction of seeing something he’d hunted provide food for his family. And me? I conquered the wing. 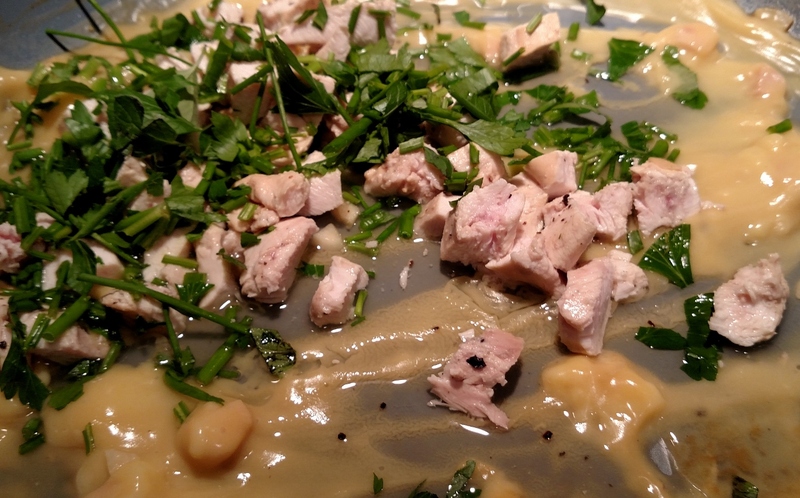 Simmer breasts whole in the chicken broth and garlic just till cooked through. Remove from pan, dice into half inch cubes. Chop broccoli into bite sized pieces. Pour the meat and sauce mix into the center of the rectangle, and wrap the fringe edges one over the other, bottom to top. Bake at 400 degrees for 30 minutes, or until nicely golden on top. 1. 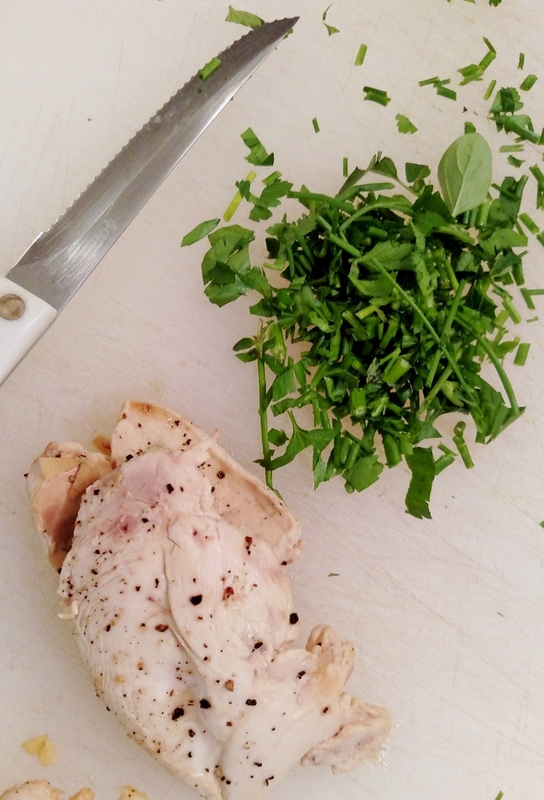 Cook breasts whole, then chop, return to pan, and add veggies, herbs, and soup. 2. 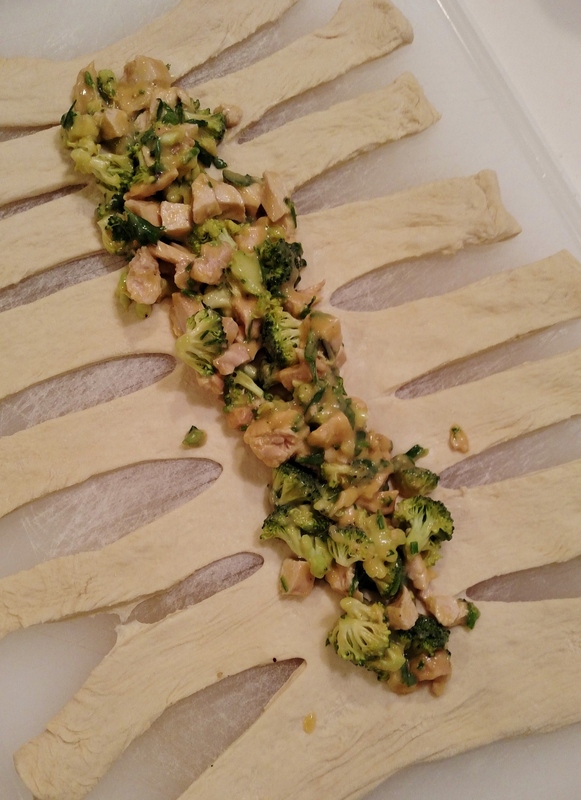 Roll out your dough, then cut the edges 3 to 4 inches on both sides. It looks a little like a skeleton. Pour meat mix into the center. 3. Here’s the fun part. Braid the bread. Just lay one piece over the other, diagonally working up. Tuck the bottom pieces under when you get to the top. 4. Finished braid. From here, brush with egg wash if you’re using real dough. 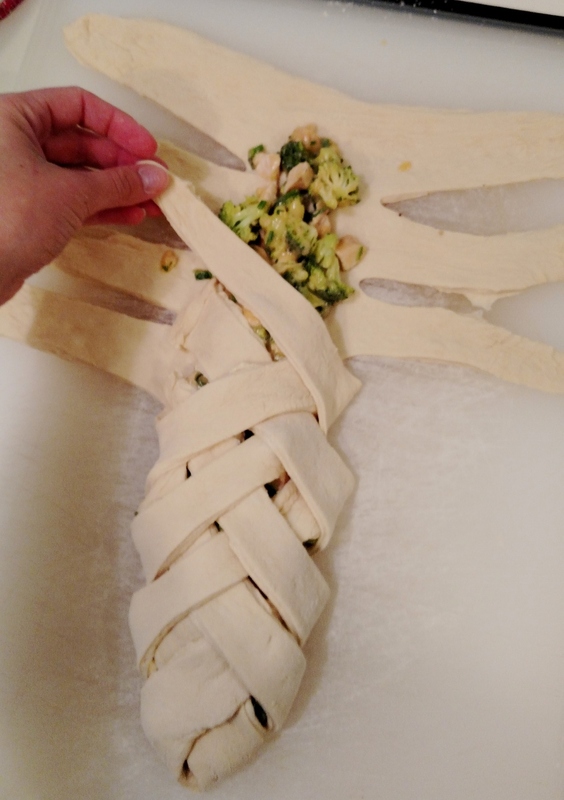 No wash necessary if using crescent roll dough. Bake at 400 (or according to your bread package instructions) for 30 minutes or until golden. 5. Baked braid. Yes, it tastes as good as it looks. A few weeks back, I told you how I realized that sometimes, the only way to start is to START. Meanwhile, I’ve had an idea in my head for a couple of months now. I’ve waffled over the best platform for it, and have learned a couple of things along the way. 1. I belong in the blogging-for-dummies camp, technically speaking. I can talk a little talk, but when it comes to SEO and monetizing and GIMPing up my pictures, I’m too busy sniffing out the culprit of that mysterious stench upstairs (you don’t want to know) and scrubbing crayon off the kitchen floor. And 2. I have about thiiiiiiiiiiiis much time to focus on developing new ideas. See #1. That was a long, roundabout way to tell you that for now, we’re simply starting a new series around here called Amateur Farm Hour. Amateur Farm Hour. Because let’s be real. What I’m doing is all amateur. I’m not trendily clad in buffalo plaid and shooties when I’m cleaning the chicken coop. (Okay. Shooties might not even be a thing anymore. I’m that behind.) I’m wielding a shovel that’s actually dirty, and a pair of worn out garden gloves that barely keep crud off. My children aren’t always instagram-ready. Half the time, my eldest is in some sort of off brand pajamas. Ponytails are wonky, pants are too short. Shoes are a crap shoot. What I put on the table is 50% awesome, and 50% overcooked/underdone/fallen/substituted/unpinteresting fare. And pictures. Let’s talk about pictures. Because you know there’s the crop tool. The lightening, brightening, color temperature filtering options. Yes, good pictures tell a story. But rarely is it the whole truth. The whole truth is that I could sell you on my attempts at a sustainable family lifestyle. I could talk blithely about our free-range chickens and their glorious golden-yolked eggs. I could probably manage some stunning shots of our heirloom Wealthy and Honeycrisp apple trees. I could show you my freezer full of labeled bags of garden veggie sauce from our raised-bed garden. Hashtag. Hashtag. Hashtag. Meanwhile, you might think I have it all together, and follow this series because it’s a pretty place to find funny farm stories and fall recipes and to see cute kids. And we’d both miss the point. Yesterday, I grabbed an extra gallon of milk from the store. (For the record, that made four gallons of milk in my cart. Apparently we need a cow.) My goal was to make yogurt since the girls have been on another one of their crazes, and the new mantra/chant at breakfast is now MORE. BIG. YOGURT. PWEEEEESE. 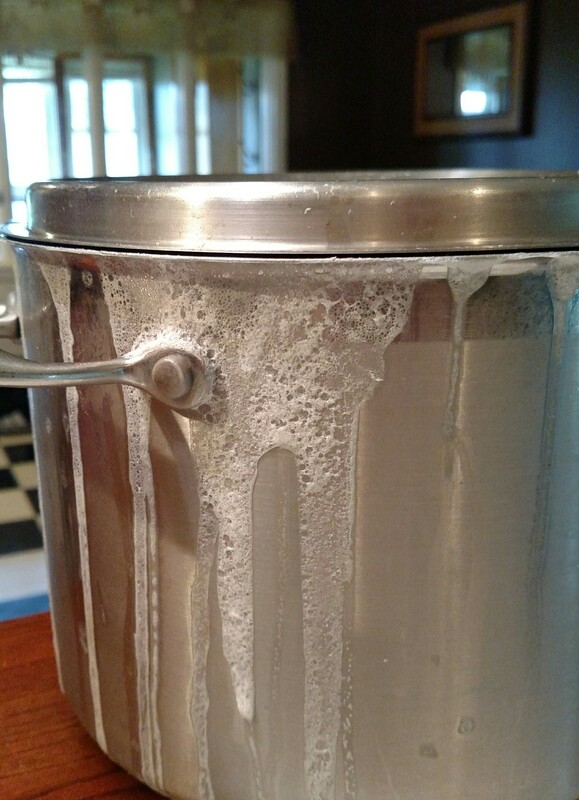 We got home, and somewhere in the middle of the chaos, I pulled the soup kettle out of the cupboard, dumped a gallon of milk in it, plopped it on a lit burner, and put the lid on. Homemade yogurt is a multi-step process, and since it was already 4:00 pm, I needed to get moving. And then I glanced out the door. 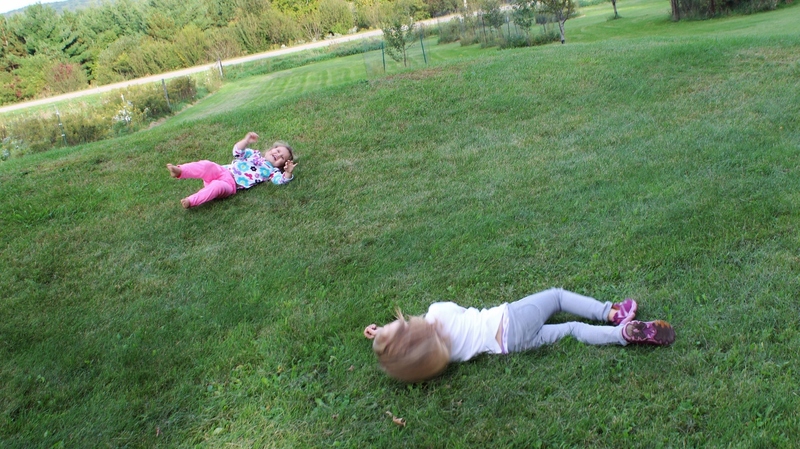 The girls were rolling down the hill in the front yard, busting out peals of laughter. My oldest called out for me to come and join them, and it took all of three seconds to abandon kitchen ship, grab my camera, and run outside for the next hour. We finally all piled back in the door around 6:00 pm, red-faced and covered in grass. I issued an immediate bath edict, but my nose was already starting to smell something else: the odd, semi-sweet fragrance of boiling milk. Boiling. Crap. Boiling means the milk is at least twenty degrees over the 180 degree desired warming point. Which means I’d basically annihilated my chance at having the yogurt culture. I should have dumped the pot and moved on. A trained chef would not have thought twice about starting over. Unfortunately for me (and everyone around me), I’m not a trained chef. I’m a product of frugal parents and depression-era grandparents, and if there’s one thing that irks me, it’s waste. Which is why I added the yogurt starter, agave nectar and vanilla anyway. You know, because instead of wasting one item, it’d be better to waste four. Brilliant, I know. Three hours into incubation, the yogurt refused to set. I had also reached max capacity for any task involving real energy (mombie zone) so I haphazardly rearranged a fridge shelf, shoved the entire soup pot of warm yogurt-not-yogurt in, and went to bed kicking myself for ruining the batch. The next morning, I opened the fridge and stared at the pot. It was time to start getting creative. What could I use sweet, yogurt-laced milk for? Right. Muffins of some sort. I pulled out the mixer and got started. I made it halfway through the recipe before I took the lid off the pot to grab a cup of milk. Miracle of small miracles, it had cultured. I practically danced it to the counter. The yogurt wasn’t thick, but it was rich, creamy, and sweet. And aside from my failure to tend it properly, it still made something good. It was allowed to become something good because I didn’t give up. I waited for another angle. A new idea. Maybe that’s how it goes in your kitchen, or in your office, or at your table too. Great ideas, good intentions, and then wham. Distraction. Need. Real life headbutts creative life and suddenly everyone’s knocked out on the floor. Please don’t let that stop you. Don’t throw away your messes, your failures, your imperfect attempts. You are not defined by these things. I believe you are fluid, and your definition rests in the cupped hands of God – God the creator, God the author, God the perfecter and finisher. He doesn’t give up on you. He doesn’t see you as failed yogurt. He does not see your bad day at work or your temper with loved ones as who you ARE. He knows sometimes, it’s the best show in town because those folks are having fun. They may not be doing everything right, but they have a good time trying. That’s what we’re doing around here. Having a good time trying. It’s not always picture perfect or hipster-worthy, and that’s okay. It’s amateur farm hour. And you’re invited. In between posts, you can laugh along at my #amateurfarmhour pics on Instagram (@rachelriebe). Like how this series is starting off? Share it with a friend! See you next week! 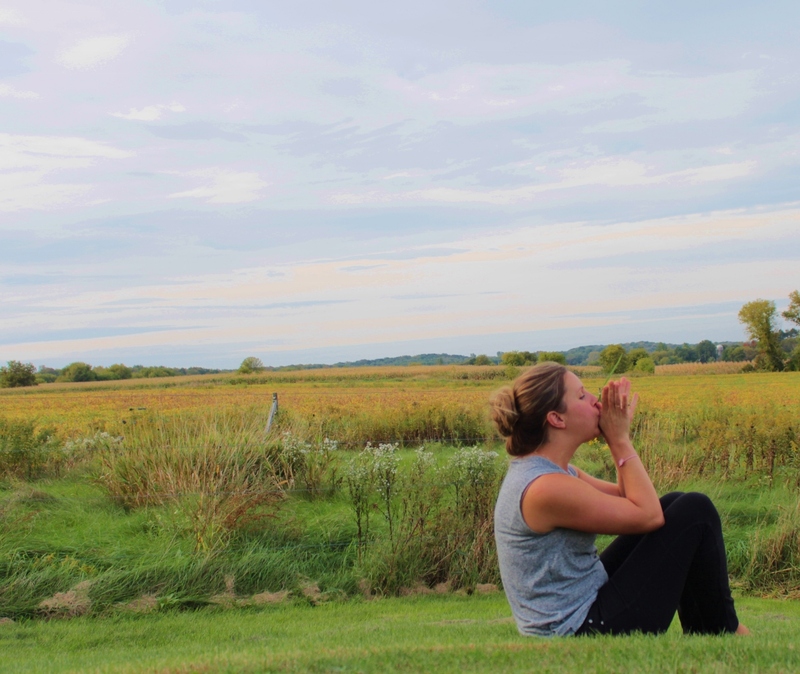 Because fashion blogging is slightly hilarious to me… tank top – past season Gap outlet. Pants – worn out Athleta jeggings. Little girl hairband/wrist bracelet – Walmart. Blade of grass kazoo – sustainable product of Riebe Farms.